DebriSat will shed light on what happens to satellites that collide in orbit (Credits: ESA). The University of Florida, sponsored by NASA and the US Air Force’s Space Missile Systems Center, is developing DebriSat, a spacecraft created to be purposely destroyed on the ground. DebriSat is a microsatellite of 50 kilograms (110 lb) fabricated and tested to be the target of a hypervelocity impact. This test will be used to replicate on Earth the amount of energy experienced during a typical impact between two orbiting satellites. Before DebriSat was designed, many studies were done on low-Earth orbit missions within the last 15 years to identify modern trends in hardware, material, and construction practices utilized. Although DebriSat could be seen just as an engineering model, specific attention has been placed in its fabrication on the quality, type, and quantity of the materials used, to ensure a realistic destructive outcome. The experiment will be performed to provide a model describing the orbital environment related to the less-than-10-centimeter objects. Laboratory-based experiments are fundamental to collect data for smaller debris because the U.S. Space Surveillance Network (SSN) observations are limited to 10-centimeter (4 in) and larger objects. Therefore, the goal of DebriSat is to improve the NASA standard satellite breakup model from the examination of the debris’ physical characteristics created in the collision. NASA and the US Department of Defense are not new to such experiments. In 1992, they organized an experiment called Satellite Orbital Debris Characterization Impact Test (SOCIT) to define a satellite breakup model. SOCIT was a ground experiment and the target was a 1960 U.S. Navy Transit satellite. However, the leap forward in the technology and material used in the present satellites has made that characterization not effective anymore, creating the opportunity for DebriSat. DebriSat’s impact test is scheduled in early 2014 at the Air Force’s Arnold Engineering Development Center in Tennessee. 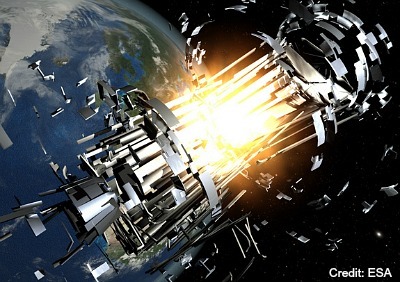 After the impact every fragment will be measured individually and data delivered to and analyzed by the NASA Orbital Debris Program Office that will use the information to enhance the satellite breakup model and to provide improved impact risk assessments.